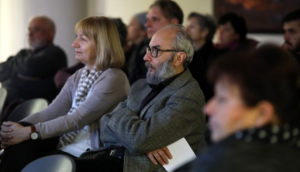 Researchers of the ERC BIRTH project took part in the 4th International Conference “Neolithic in Macedonia” which was organized by the Center of Prehistoric Research (CPR) and Archaeological Museum of Macedonia. During their stay in Skopje between 12th and 13th of December, our team presented two papers which are a part of the ongoing BIRTH project. Vesna Dimitrijević, together with her colleagues G. Naumov, Lj. Fidanoski, S. Stefanović worked on the paper “Украсни предмети од школките на морските мекотели во неолитот на Македонија”, and Darko Stojanovski presented the paper he wrote with J. Dunn, G. Naumov, R. Evershed and S. Stefanović “Керамика, липиди и изотопи: увид во неолитската кујна на Врбјанска Чука”.